This is a major fund raiser for our new library. Please sign up for a table. Lots of good things going on at the library in the next few weeks..
First of all is our Giant Used Book Sale May 3 and 4. All books are $1, and you’re sure to find something you like. 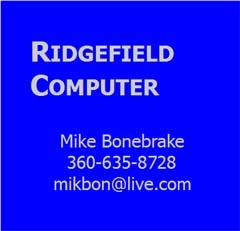 We’ll also be selling tickets for the Ridgefield Quilt. They’re $5 each, and if you buy 5 you’ll get a hand painted watercolor book mark signed by the artist (me). A treasure for sure! Then the next Tuesday, May 7, starting at 6:30, the architects for the library will be in the Community Room of our library to hear from all of you about what you’d like to see in the library. Bring your ideas, no matter how far out. Here’s an idea: how about putting solar panels on the roof to bring in natural light during the day? 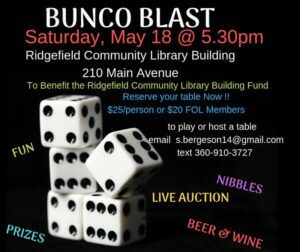 And on May 18 it’s Bunco Night for the Library. Host a table for four and come join in the fun. 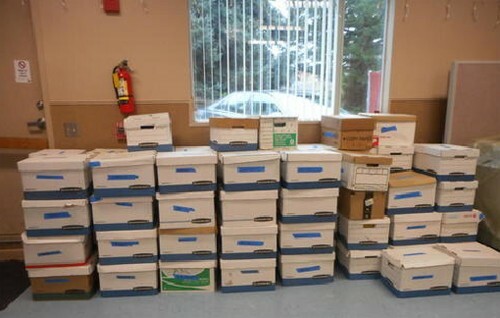 This gives some idea of the amount of used books we’ll have for sale at the Library’s Used Book Sale on May 3 and 4. 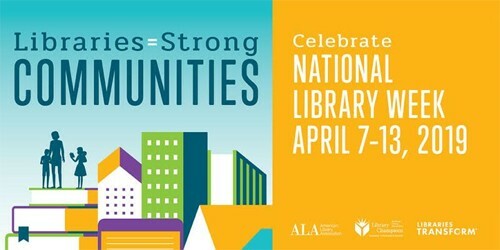 All books are $1.00 – come and stock up your book shelves and support the library at the same time. I helped set up at the fabric sale yesterday, and was amazed at the variety of wonderful material that was for sale. If you’re in the market for flannel, there are several choices – mostly for younger children, but at least one bolt. Lots of colorful fabrics, and all priced to sell. There are even some small finished quilts as well as picture fabrics ready to quilt. Come early to get the best choice – doors open at 10am. The Ridgefield Quilt will be on display – a $5 ticket gives you a chance to win it. The Ridgefield Quilt is done! 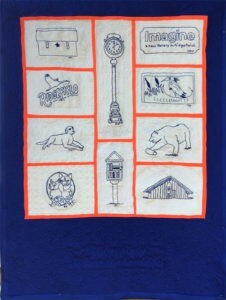 It’s a wall hanging depicting scenes around Ridgefield, including the plankhouse, the bear at Overlook Park, a little library and others. See it tomorrow at the Fine and Dandy Fabric Sale, and take a chance on winning this beautiful hand-made wall hanging. Tickets are $5 each or 5 for $25. If you buy five tickets you also get a hand painted book mark made by yours truly. Such a deal! The winner of the quilt will be picked at Hometown on December 7 and you do not need to be present to win. 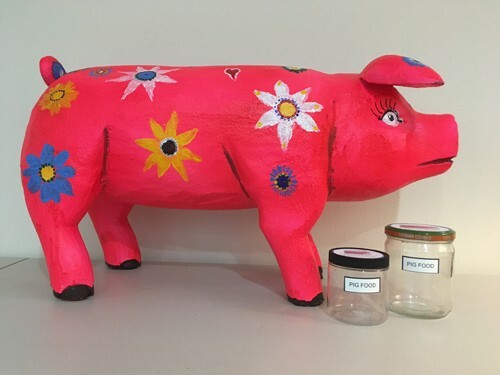 We’ll also have a stock of jars for our ‘Feed Priscilla the Pig’ campaign. Priscilla will be either in the library or the Community Room of the library. Stop by and pick up your jar and fill it with spare change. We’re trying to fill up the carboy that you’ll find in the library. Hi! I’m Priscilla Pig! I’m named in honor of the Priscilla Club because their members donated books to start the original collection of books for the Ridgefield Library. 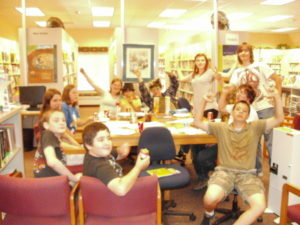 Now I’m helping raise money to build a new and bigger library in Ridgefield, and you can help. You’re going to see me around town, especially on First Saturdays and other special events such as the Fine and Dandy Fabric Sale on March 23. When you see me, I hope you’ll pick up one of the food jars I’ll have with me, and fill it with your spare change. When the jar is full, bring it back to the library on any First Saturday and you’ll receive a special little item to show you’re part of my Priscilla Fan Club. Let’s get this library built! If you’re into sewing, quilting, or making: costumes, set designs, small home décor projects, totes, handbags, or crafty projects, don’t miss this fundraiser! Community members have donated piles of all kinds of fabric, some with multiple yardages. Lots are one yard or less. VERY reasonable prices! Sunday the Friends of the Library honored the Board members of the Community Center because they donated the building and land to the library for our new library. “ I moved to Ridgefield in 1983. My first experience with the Ridgefield Community Club Association was when I was looking for a loce location to recycle cans, bottles, newspapers, etc. I found a group that recycled out of an old wooden structure off of Main Street. They were using the money from recycling as a way to buy this property and building. Their dream was to create a new community center for our town of 1400 people. Vida Piquets agreed to sell the property for use as a community center for $60,000. It took seven long years to raise that money. The tools they used were pancake breakfasts, community dinners, rummage sales, and a buy-a-brick campaign. In 1998 the RCCA receive a community development block grant to remodel/reconstruct the building. The building had structural problems, so the decision was made to demolish and rebuild the building. Partnering with the Fort Vancouver Regional Library helped generate more funds to construct Phase 1, which included the bathrooms, library and small meeting room. The building was completed in 1994 at a cost of $258,000. Move forward to 1996 when Lockett Construction built Phase 2, charging only for the cost of materials. The Ridgefield Lions donated the big kitchen equipment and metal roof and the Community Center as we know it today was complete. The work did not stop there. The revenue from operations was not enough to pay the annual insurance, property taxes and maintenance cost. Queen Allene (Wodaege) created an annual or semiannual dinner event including auctions that brought in the funds necessary to operate the Community Center. And now for more good news: the Library has leased the former Umpqua Bank building as their temporary home while the new library is being constructed. The building is being remodeled to make good use of the space. It’s about the same size as the existing library. Tomorrow Amelia Shelley, Executive Director of the Fort Vancouver Regional Library will be at the Community Center passing out plans of the current library and the new space we will spread into. We hope everyone will take one and sketch out the things you would like to see in the new library. This will be the first of several community meetings where you will have a chance to make your wishes known. If you can’t pick one up at the library there will be copies at the library. This program takes place every Wednesday from 4:00 p.m.- 6:00 pm at the library. We play a variety of game systems from Dungeons & Dragons to Pathfinder to Call of Cthulu to GURPS. This is an established, enthusiastic, fun group. New players are welcome! Plus, the Ridgefield Library has a collection of 3.5 edition Dungeons & Dragon rule books and Pathfinder rule books in the reference collection. You’re invited to grab some friends and run your own games! The Ridgefield Community Library is at 210 N. Main Avenue. Also, Sunday is the Thank You Reception for the Board of the Community Center, honoring the people who donated the building to the Fort Vancouver Regional library so the Ridgefield Library could expand. It’s from 3 to 5 pm in the Community Room. Hope to see you there! 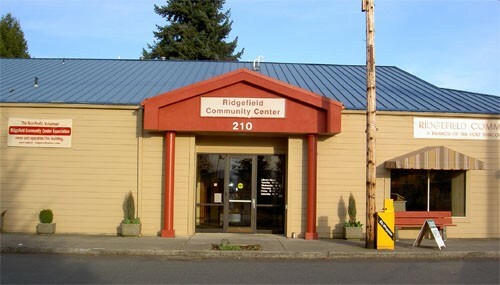 You are invited to a reception honoring the Ridgefield Community Center Association (RCCA) Board for their recent donation of the building and land to the Fort Vancouver Regional Library’s (FVRL) planned expansion of the Ridgefield library. 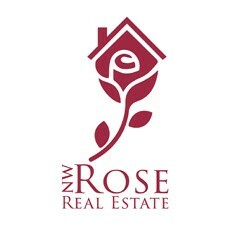 The Recognition Reception is Sunday, February 24, from 3 to 5 pm in the small room at the Ridgefield Community Center. 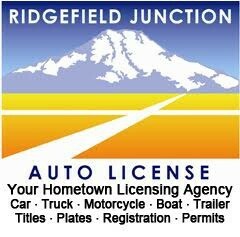 The RCCA teamed up with the Ridgefield library in 1994 when the library wanted to expand from the Priscilla Club building to their current location. The FVRL District worked hand in hand with the RCCA to plan and apply for grants to facilitate that building project. 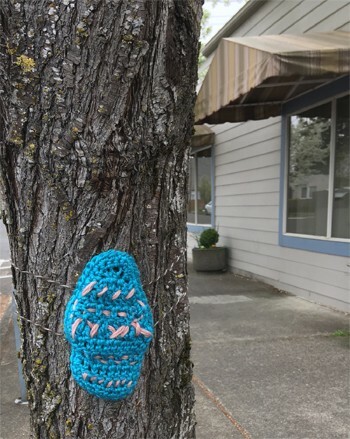 After operating the Community Center (the heart of Ridgefield) for 25 years, the RCCA Board felt it was time to allow the library to grow once again, especially since Ridgefield’s population has grown remarkably, and there are now many venues available for groups of many sizes. 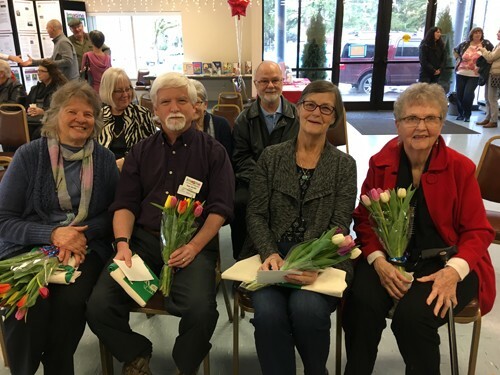 The Friends of Ridgefield Community Library feel that the RCCA Board deserves recognition for their efforts in creating community and library space. Without them, the heart of Ridgefield would not beat so strongly. Please join us in celebrating a group that worked tirelessly to benefit our community.